These spindles are specifically made for the front steering knuckles for the Superformance® Mk-III Cobra replica. Thus the name, Super Spindles! 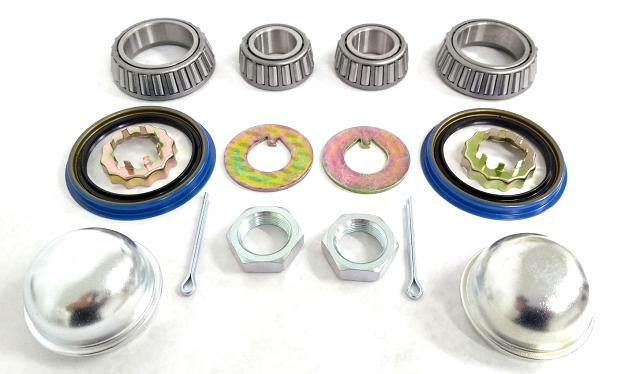 These spindles are made from one piece, high strength precision machined alloy and are thicker, stronger, reinforced, and improved design all while retaining the OEM connections dimensions. Both spindles retain the same suspension ride height as the OEM version. The original brakes can be retained and additional brake caliper mounting bolt patterns are included as well. Choose from either the Standard Replacement version or for the Geometry Correction ball joints to maximize the performance and precision of the ball joints which changes the upper and lower control arm angles to reduce bumpsteer and enhance hi-speed stability and safety. The upper and lower tapered holes are precision hand reamed to the perfect depth to set both the upper and lower ball joint to the optimal height and control arm angle to take the most advantage of our R/T Geometry correction ball joints which reduce bump steer, steering shake and improve high speed stability and handling. Note R/T spindle is one peice with a huge reinforced rib in the center for maximum strength without all the extra unsprung weight. 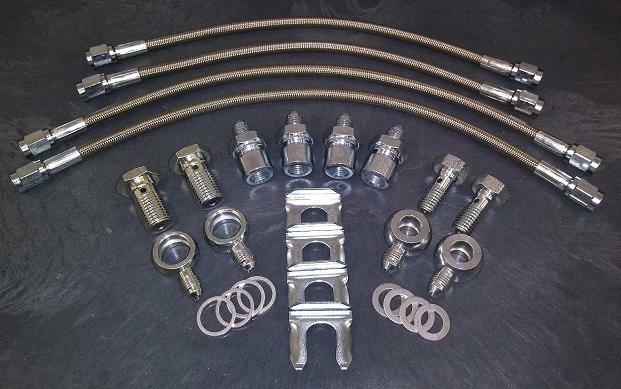 The larger R/T spindle uses the same Superformance caliper mount bolt pattern but also incorporates other bolt patterns for other brake caliper mount configurations. 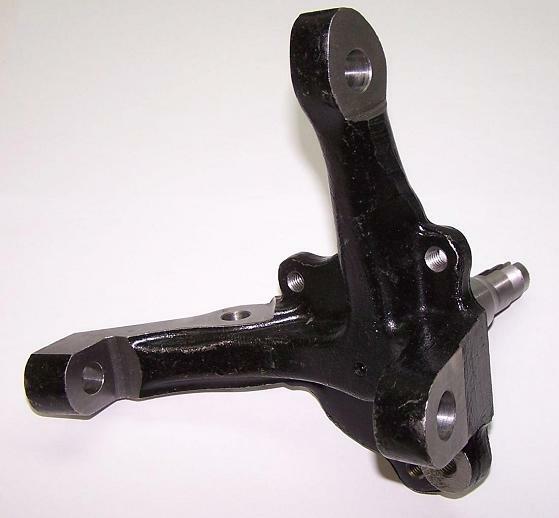 The R/T spindle has increased material and strength along the the steering arm as well as a smoother structurally stronger design. 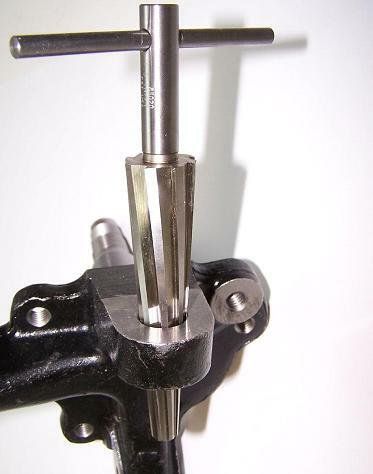 The R/T spindle uses a much thicker, wider and stronger mounting location for the ball joints. The R/T spindle's stronger ball joint mounting locations results in a stronger, more precision performing spindle for both street and track! Street report: "...I took #309 for a shake-down cruise, just to make sure everything is AOK following completion of new parts installation work. STEERING: Steering is remarkably improved - the difference due to new ball joints and new spindles is dramatic. Much easier turning - especially noticeable at lower speeds. Very impressive. I have yet to get needed four-wheel alignment. If your stock spindles are not worn in the tapered area of the ball joint seat and you are using your car for general street and performance situations, the stock spindles should be acceptable. However, if your new ball joints seat deeper than suggested, or you drive your car at high speeds where maximum stability is desired, keep in mind that the stock spindle tapered depth variance as well as the inconsistency from side to side will all have a negative effect on the final result after installing the new performance ball joints. In that case the new precision spindles will solve those problems as well as increase steering geometry performance and stability. There are very subtle differences and minor modifications you would need perform to use these spindles on the newer Superformance Cobras produced after the year 2000-ish or after production chassis number 700-ish. 1. This spindle stub is .295" longer than the 700+ spindle so the cotter pin may not clear the slots in the nut completely and the hole may need to be elongated. 2. The spindle's inner seal surface diamter is .065" larger than the 700+ spindle so a sleeve needs to be made that is .032" (1/32") thick and pressed over the seal surface on this spindle. You may also find a smaller seal for the 700+ hub you are using.